Representatives of different organisation today meet the authority of the National Highway Infrastructure Development Corporation Limited (NHIDCL) and submitted memorandum for immediate repairing of the Trans Arunachal Highway (TAH) from Talo-Yapak Geko. The team of led by Nyishi Elite Society (NES) General Secretary and Palin Employees Welfare Association (PEWA) President Heri Maring meet NHIDCL’s General Manager Col. Prabhakar Kumar at his office here at Niti Vihar today and submitted memorandum for immediate repairing of Talo-Yakha camp to YapaK Geko road from 20KM to 50KM within first week of October 2018. While discussion with the officers of the NHIDCL Maring informed them that Joram-Koloriang road is one of the oldest road which is the lifeline of lower Subansiri, Kra Daadi and Kurung Kumey districts and is also very busy and important road in Defence Strategic point of view. The road stretch is in deplorable condition at many locations and a possible threat of loss of life and property. Despite commuters are facing lots of problem , but still compel to use this road because there is no any alternative road , Maring said. 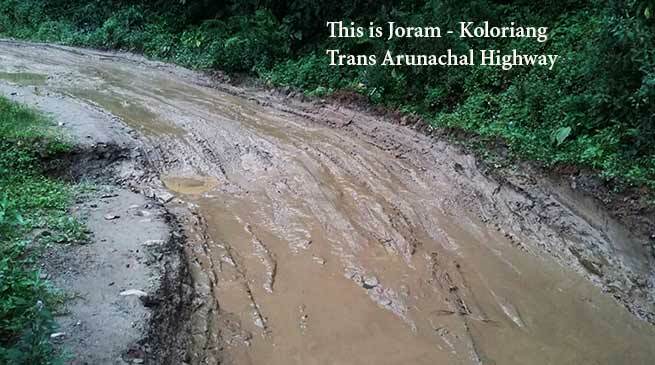 Maring while taking to media person said that the said Joram – Koloriang road was initial constructed by General Reserve Engineering Force (GREF) in 1962. During Indo-China War in 1962 GREF stopped construction works near Talo Village and ran away in afraid of war and did restart the construction work. Ultimately PWD has taken over and was under PWD till 1998. With the initiative of leaders of Palin, Nyapin, Tali and Koloriang the said road was once again handed over to BRO and it is the fourth time said road is handed over to National Highways Infrastructure Development Corporation Limited and now NHDCL is looking. The team has assured all support and cooperation for immediate repairing and maintenance of said stretch of road and also for construction of Joram-Koloriang road. NHIDCL General Manager Col. Prabhakar Kumar has assured to start the repairing and maintenance works of said stretch of road from 20KM to 50KM Talo-Yakha camp to Yapap Gyeko for which the tender works is nearing completion and work would be started within next two week.